Here we record and compare our benchmarks in the latest games and most popular benchmarking software for top-tier RTX & GTX graphics cards. If you’re considering purchasing any of the following GPUs, these statistics will no doubt aid you in choosing the best card for your needs. Our graphics card testing system runs top-tier components to ensure no bottlenecks and optimum performance when benchmarking! 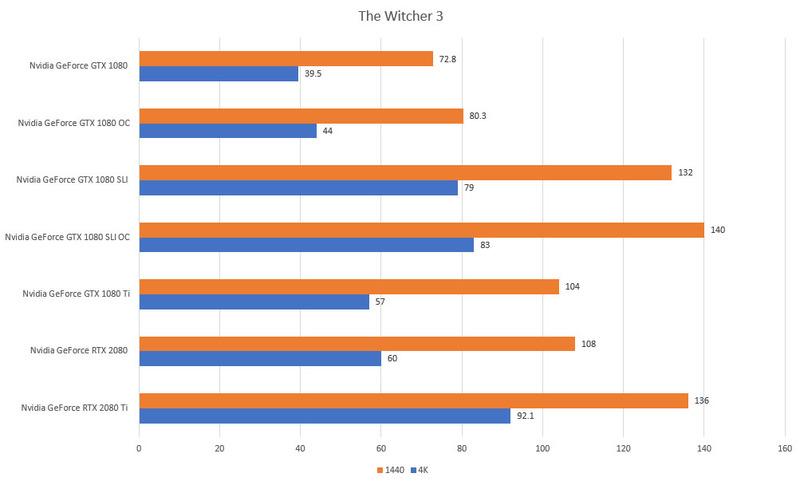 We test all games using the in-game benchmark calibrated to the highest possible graphics quality/settings. VSync, frame rate caps as well as GPU technologies such as FreeSync, TressFX, G-Sync, GameWorks disables. Temporal anti-aliasing is enabled. Both 1440P and 4K resolutions are tested and compared for all the graphics configurations listed above. As you can see, the Nvidia GeForce RTX 2080 Ti tears through Assassin’s Creed Odyssey at 1440P but starts to struggle at the 4K resolution. The RTX 2080 and GTX 1080 Ti fares even worse and the 1080 struggles to perform in this incredibly demanding and arguably poorly optimized game. Dialing down settings is a must to achieve the gold standard 60 FPS mark in AC Odyssey when gaming at 4K. Assassin’s Creed Odyssey does not have support for SLI so the GTX 1080 SLI benchmarks are not possible. Again, the RTX 2080 Ti shows why it’s the top dog these days. Nearly 20 additional frames in 4K compared to the GTX 1080 Ti. The RTX 2080 performs better than the GTX 1080 Ti and substantially better than the GTX 1080 in these benchmarks. This is the start of a trend where we’ll see again and again that the RTX 2080 proves to be a worthwhile upgrade to GTX 1080 owners. Here again, the RTX 2080 Ti destroys everything else. 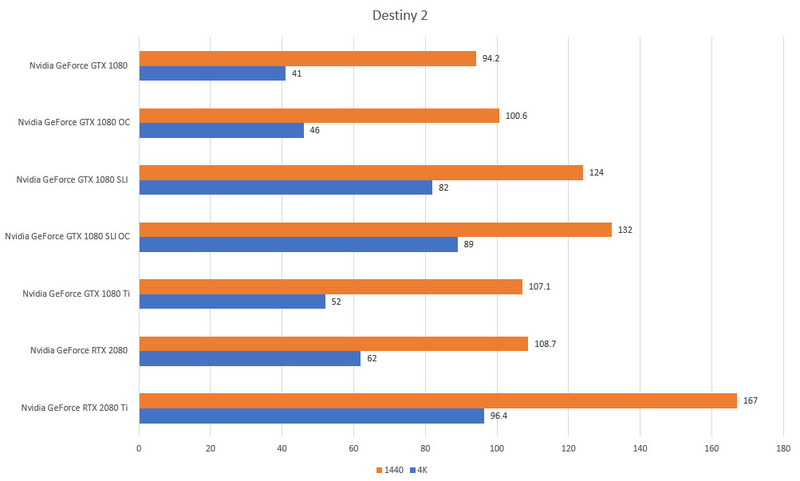 It’s starting to seem worth the price… the RTX 2080 and GTX 1080 Ti run essentially even in Destiny 2, leaving the GTX 1080 noticeably far behind when running the game at 4K. 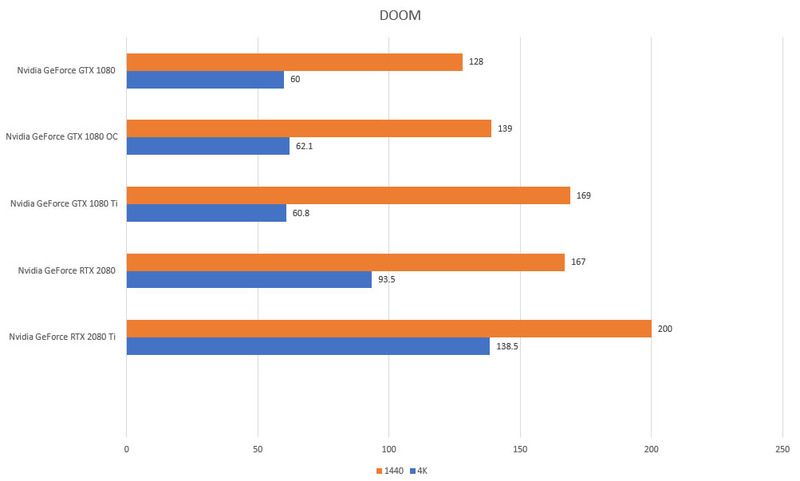 The gap between the RTX 2080 Ti and GTX 1080 Ti lessens a bit in DOOM, either way though there’s plenty of frames to go around. The RTX 2080 fits right in here as well, I guess DOOM is simply too easy to run! DOOM does not have support for SLI so the GTX 1080 SLI benchmarks are not possible. 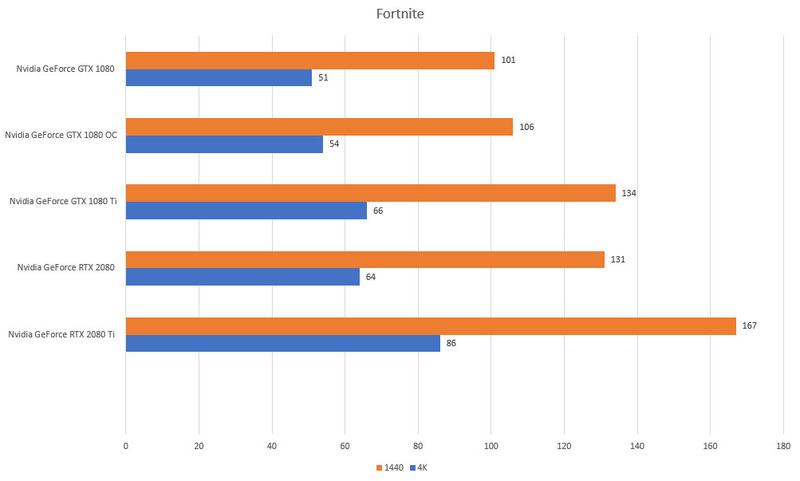 Like DOOM, the stats in Fortnite are very similar between the two top-tier consumer GPUs. Of course, the Turing card performs better as expected. The RTX 2080 and GTX 1080 Ti run neck and neck again here. Fortnite does not have support for SLI so the GTX 1080 SLI benchmarks are not possible. Here’s where it gets interesting. The RTX 2080 Ti is on par with SLI’d 1080s in 4K benchmarks yet beats them in 1440p. Like Assassin’s Creed Odyssey, even the mighty GTX 1080 Ti struggles to break 60 fps at 4K resolutions. The RTX 2080 achieves runs slightly behind the GTX 1080 Ti in both 1440P and 4K resolutions. 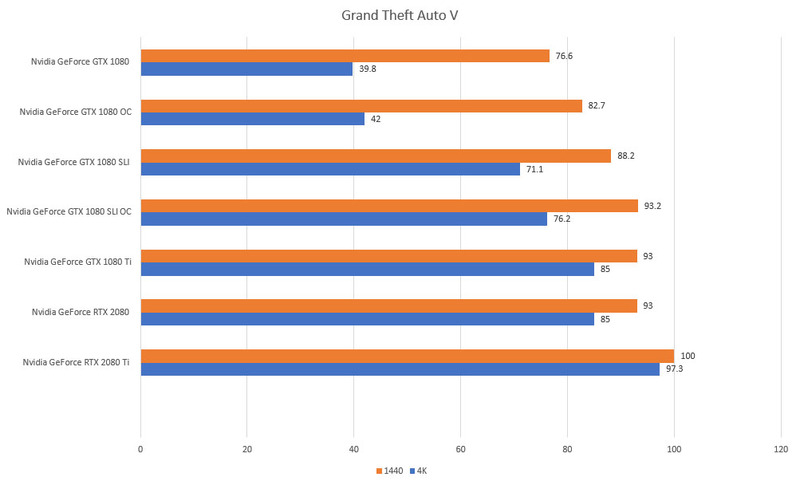 Both the RTX 2080 Ti and GTX 1080 Ti perform excellently in GTA V. Yes, the 2080 Ti pulls away at 4K resolutions but again, can’t complain with either card here. 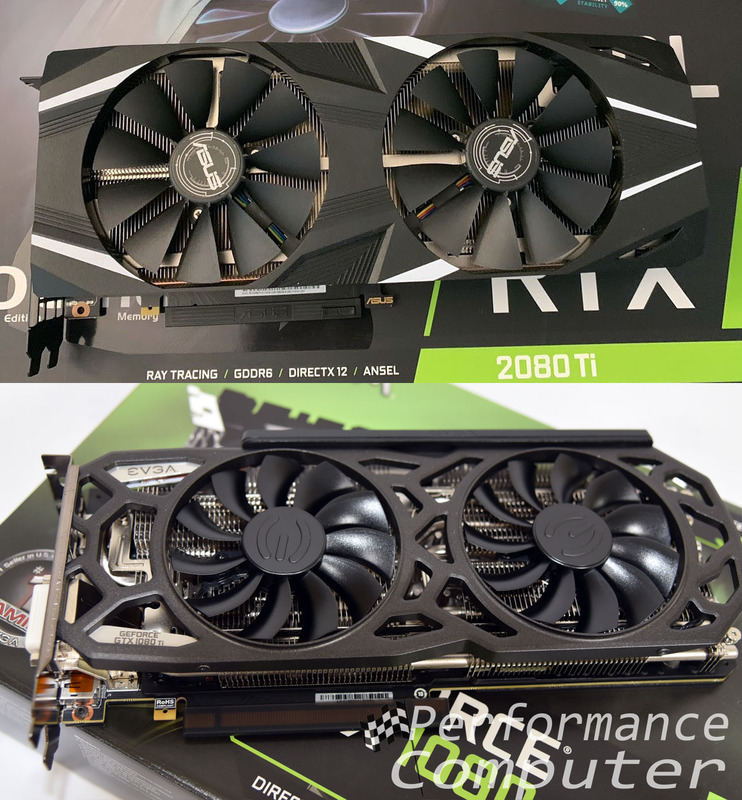 The RTX 2080 yields virtually identical results when directly compared to the GTX 1080 Ti. 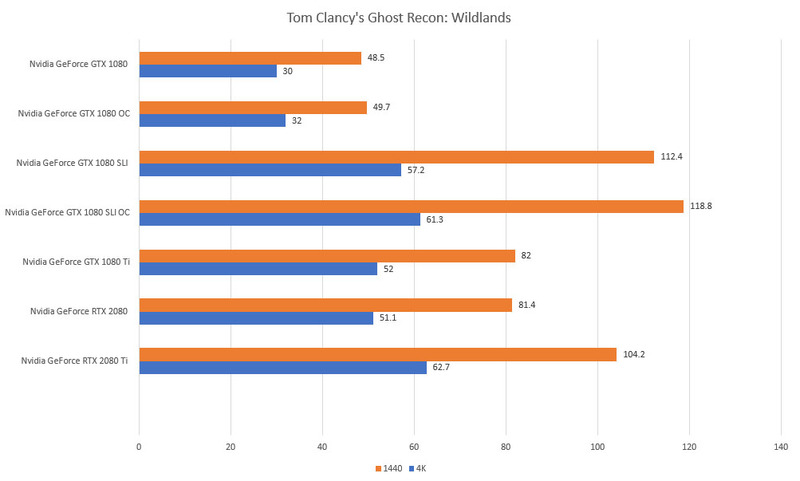 Being a synthetic benchmark, 3DMark Fire Strike results display optimal scaling when multiple graphics cards are used but as seen above, SLI’d GPUs rarely produce real world improvements when compared to a single top-tier GPU such as the RTX 2080 Ti or the GTX 1080 Ti. 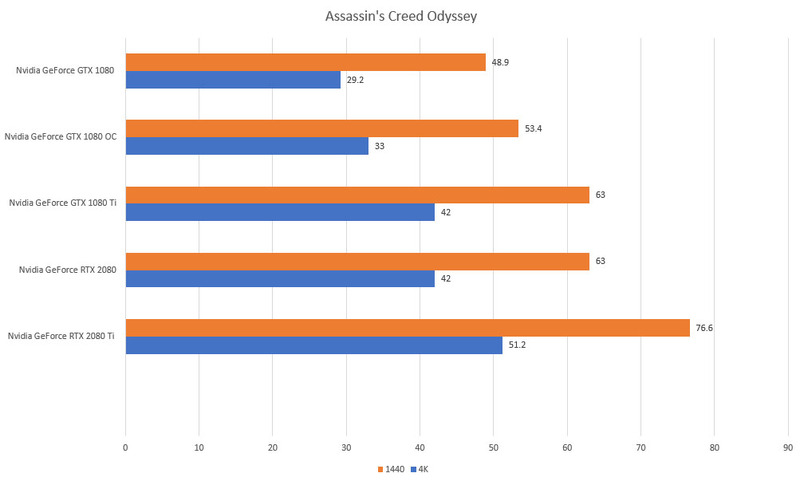 Much of this can be attributed to lack of optimized driver support or support at all for SLI in games such as Assassin’s Creed Odyssey, DOOM and Fortnite.